For 22 years people have been raising their hands and raising eyebrows as they voluntarily jump into a freezing cold lake in the heart of a Minnesota winter. STA President Tom Mortenson (the Viking) continues his annual tradition of jumping in the icy waters to raise money for the Boys and Girls Clubs of Detroit Lakes and Perham. This Lighting fan flies across the sky (okay in an airplane from Tampa) to jump with other daring or zany folk who all want to help raise money for the youth in his home community of Detroit Lakes, MN. This Viking takes on the icy water frozen movie like environment to triumph once more by raising money for the kids. 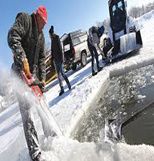 (See beginning of Frozen movie on how they used to cut ice in his home town lake or visit Detroit Lakes newspaper or the Detroit Lakes Chamber for additional details – including building of an ice-palace). On February 17, 2018 Tom will be participating in the 22nd Annual Polar Fest Plunge for Boys & Girls Club of Detroit Lakes. I think it’s cold enough—and I’m bold enough—to take a freezing Plunge into Little Detroit Lake for the youth of country! Seems like a logical Viking event. The other option open to all Vikings —join me in taking the Plunge for Boys & Girls Club with me! Join a fellow Viking in making a splash for our youth. 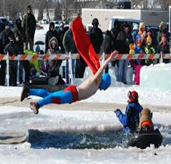 The Polar Fest Plunge is for the Boys and Girls Club of Detroit Lakes and Perham, Minnesota. That’s right a polar plunge – jumping into a frozen Minnesota lake in the middle of February. 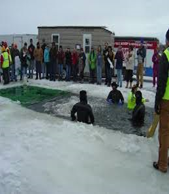 The city cuts a hole into Little Detroit Lake, removes the big ice to allow SAG employee, Tom Mortenson (USCENTCOM) to jump in to raise money for the local Boys and Girls Clubs. (Tom had jumped the last six years and makes a special trip back from Tampa just to participate out of his own funds– and this year will be dressed as a Banana. Swedish Company Coming to Tampa!